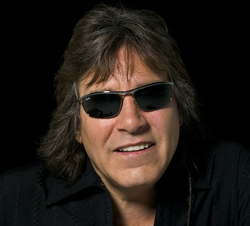 One of the most prominent Latin-born performers of the pop era, singer/guitarist Jose Feliciano was born September 10, 1945, in Lares, Puerto Rico; the victim of congenital glaucoma, he was left permanently blind at birth. Five years later, he and his family moved to New York City's Spanish Harlem area; there Feliciano began learning the accordion, later taking up the guitar and making his first public appearance at the Bronx's El Teatro Puerto Rico at the age of nine. While in high school he became a fixture of the Greenwich Village coffeehouse circuit, eventually quitting school in 1962 in order to accept a permanent gig in Detroit; a contract with RCA followed a performance at New York's Gerde's Folk City, and within two years he appeared at the Newport Jazz Festival. After bowing with the 1964 novelty single "Everybody Do the Click," he issued his flamenco-flavored debut LP The Voice and Guitar of Jose Feliciano, trailed early the next year by The Fantastic Feliciano. ​Unhappy with the direction of his music following the release of 1966's A Bag Full of Soul, Feliciano returned to his roots, releasing three consecutive Spanish-language LPs -- Sombras...Una Voz, Una Guitarra, Mas Exitos de Jose Feliciano and El Sentimiento, La Voz y La Guitarra de Jose Feliciano -- on RCA International, scoring on the Latin pop charts with the singles "La Copa Rota" and "Amor Gitana." With 1968's Feliciano!, he scored a breakthrough hit with a soulful reading of the Doors' "Light My Fire" that launched him into the mainstream pop stratosphere; a smash cover of Tommy Tucker's R&B chestnut "Hi Heel Sneakers" solidified his success, and soon Feliciano found himself performing the national anthem during the 1968 World Series. His idiosyncratic Latin-jazz performance of the song proved highly controversial, and despite the outcry of traditionalists and nationalists, his status as an emerging counterculture hero was secured, with a single of his rendition also becoming a hit.